First in a series: Understanding Electric Power Systems. Also, Jim shares email from our readers. It seems that a lot of e-flight beginners have trouble understanding electric power systems. If you are confused about how electric motors work then follow along with me as I present a simplified electric motor model. Why simplified? Because the real world is darn confusing and complex that's why! Plus, we don't need to worry about every little loss and friction in the real world if all we are trying to do is understand the basics. Lets imagine a simple electric motor which we will call the Ideal Motor. We call it "ideal" because it has extremely simple characteristics and is 100% efficient in operation. Our motor has a single quality: for every volt of energy applied to it, the motor will turn at exactly 1000 RPM. On 5 volts the motor will turn 5000 RPM, on 25 volts the motor will turn 25000 RPM. The RPM will always be equal to the amount of volts applied to the motor times the constant of 1000. Careful observers will note that the table above looks a lot like the first table. Our Ideal Motor and Ideal Cell make life very easy for us, don't they? We can almost use the words "cell" and "volts" interchangeably because of our contrived values. Naturally, the real world isn't quite this simple, but its not entirely unlike our Ideal world either. Keep that in mind as we go along. But! You may notice that our motor is just happily spinning away and doing nothing! We need to add something to the output shaft so that it can twirl around and move lots of air. So lets put a propellor on our motor and watch what happens to the RPM. In fact, lets compare two different propellers with the same motor given various cell counts. If you are really new to R/C then you might need to know how propellers are specified. Each propeller has a diameter and a pitch. I assume you know what "diameter" means, but the word "pitch" can be a little confusing. The "pitch" is the distance the propeller would travel forward in one revolution in a perfect medium. The higher the pitch the more angled the blades of the propeller are and the farther it would travel in a single revolution. A high-pitch prop is usually used on a fast airplane while a low pitch prop is usually used on a slow airplane. In the US, where I am from, propellers are specified in inches. Lets use two propellers for our example. One will have a 5 inch diameter and a 5 inch pitch, which we'll designate as 5x5. The other will have a 12 inch diameter and an 8 inch pitch, which we'll designate as 12x8. Of course we must also realize that it takes far more energy to spin a 12x8 propeller at 4000 RPM than it does to turn a 5x5 propeller at the same rate. There must be something missing from our simplified motor model or all those Speed 400 pylon racers out there would be flying with 18x18 propellers. The above formula is the most important formula you will ever encounter and may someday save your life. Ok, I'm exagerating here, but these articles are really boring if I don't take poetic license once in a while. The fact is, though, that I use this formula in some way almost every day (man, I just realized what a dork I am...but I digress). The formula relates energy as a product of Volts and Amps. You see, volts is only part of the energy equation. Without Amps, you don't have any energy at all. The word "Watts" is just a fancy way of saying "energy" or "power". Over time, watts can perform work. Y'know, work: that stuff that all your co-workers are doing while you read this web page. Note that these are mythical values! Please note that the watt values I gave in the above table are not actual values. I'm just using simple values (that mirror reality in a few key ways) to demonstrate a point. And that point is that it takes a lot more power (energy) to turn a 12x8 prop at 4000 RPM than it does to spin a 5x5 prop. Also it takes more than twice as much power to spin a prop at twice as much RPM. So we can actually get 100 watts in many different ways. Our motor, though, is hard-wired to give us exactly 1000 RPM per volt regardless of anything else. Since we are trying to spin our prop at 3000 RPM, this means we need 3 volts. And, therefore, our motor must be drawing 33 amps of current from our Ideal Cells. This is an inescapable conclusion. For our motor to turn 3000 RPM with that prop it must have 3 cells and it must draw 33 amps because 100 watts are required to perform that demanded task. Based on what you've learned, can you answer the following questions? How many RPM will my Ideal Motor spin if I apply 17 volts? How much current will my Ideal Motor draw if I bolt a 12x8 prop on it and attach it to an Ideal Cell? 2 Ideal Cells? 3 Ideal Cells? Suppose I had an Ideal Airplane that was lacking in power but I didn't want to add cells, what would you suggest that I do? Thats probably enough learning for one month. Lets continue the discussion next month. As we progress we will add a little bit of "real world" effects until finally we have a complete understanding of an electric power system. As always, I can be reached via email at jbourke(at)ezonemag.com for any questions you might have. I am sending you this letter as a contribution to you online site and you may publish it if you find it interesting. First a little about myself and my background as a modeler: I am 48 years old and I have been into aero modeling for many years. First Control Line and then R/C modeling since 1976 when I bought my first Futaba set. My main interest is in scale models, preferably of older aircrafts but I do build and design all types of models. My designs and plans have been published in magazines in Sweden and also in international magazines such as RCModeler and various British magazines. I have not tried electric flight until this summer, mainly because we have no problems or restrictions with noise at our flying site and electric powered models are not common here yet. 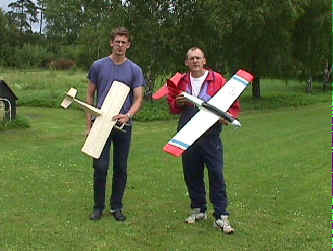 In fact, I am the first in our club to fly an electric powered model. I decided to buy a kit (unusual for me!) and try to find out what electric power is about and how it works. I bought an Aerojet kit from the British company Galaxy. The kit arrived and turned out to be a high quality kit with a traditional building sequence. The wings are made from foam and come complete with the wing skins glued on. Very high standard on the surfaces. The model was fairly quick to build and I found no problems. I made some modifications: ariscoops for inlet and outlet of air passing over the engine, and I also made the removable hatch for the battery pack easier to open and close. I chose to cover the model with 9g/m2 glassfibre cloth and epoxy resin and achieved a good surface with light sanding before I sprayed the model with automotive paint. The weight of the completed model with a 7 cell nicad is slightly over 1000 g.
Together with the kit I bought a Graupner Speed 600 BB, a 40 amp speed controller and a 1700 mAh nicad pack. I use the BEC facility included in the speed controller and 2 Hitec Hs 101 mini servos for aileron and elevator. After some initial problems with the speed controller (that only worked for 2-3 minutes before some electronic part broke and had to be sent back for repair) it was time for test flying. The test flying was done on a windy day at the club field and my son Patrik gave the model a good throw against the wind and the model climbed away nice and steady. Only a few clicks of aileron trim was necessary. I flew for 6-7 minutes and landed with power left for at least 1 minute. We left the field with a feeling of total success! I have now flown the model on many occasions and it is really a good model. I get 7-8 minutes flights on a 1700 pack with most of the flying done at above half throttle. The only thing that is poor is my charger which takes too long to charge. I will sort that out by buying a good charger. I am now working on a Cassut racer from my own plans. The model will be powered by an Astro 02 brushless motor. The model is in the "400 class" and it will be very light. I really look forward to flying it! I started flying with RC 1½ year ago. The plane that I started with was a simple stick-construction made by the editor of the danish magazine: Modelflyvenyt (model plane news). The little plane is powered by a S600, 9 cells, 3:1 gearbox and 10x5 prop - that give up to 15 min. flying time (it will also fly with an S500 and 6-7 cells). The name "El a' Stik" is a non correct Danish translation of "el" and "stick" - "Elastik" is the Danisk name for the rubber used to fix the wing! The good result with the static stalled prop started some thinking: What would happen if I used a big static stalled prop on a big slow flying plane? I needed a big, easy to build plane for a test. The small plane was enlarged 2 times. Wingspan is 8 feet. All up weight is close to 12 Lb. I have added ailerons and flaps - the flaps, just to have some fun while building, but they are working, and the plane is able to land at walking speed. Obviously the name is El a' Big. I intend to try out four different power systems, based on my ability to run a single motor or use two motors in a homemade gearbox. I an just now building a computer to put into the plane (from the German magazine: Elektro Modell). The compuer is simple and relatively cheap. The computer is able to measure: Voltage, amp, rev/min, speed, hight, temp and calculate the mAH. If you are looking for a good computer-construction this one is the right one! You can contact one of the constructors, Ingo Stahl: ingo.stahl(at)koeln.netsurf.de. When I am ready with the computer I will start to test big stalled props like a 16x16 and 18x18 (APC) on the plane - the props will, like the 20x10, go approximately 4200 rev/min. Flying with E-power is fantastic, I love it. Thanks for this post, it's absolutely incredible, I'm surprised no one else has commented? Cheers this is exactly what I have been looking for. Incredibly funny & interesting article Jim! This was a good series of articles. I always felt it needed one more chapter. the last one wasn't 16 years ago.